Valve have pushed out their recent beta updates to the Steam client for everyone now, this does include the option to force Steam Play on shortcuts you've added for games outside of Steam. As an example, a game GOG recently gave away free added to Steam to run in Steam Play—it's Linux gaming store inception! It also fixes a multitude of Linux-specific issues with the Steam client including those pesky zero-byte updates for Steam Play titles, incorrect mouse wheel scrolling offsets, some games weren't properly detected as running, changing settings constantly asking you to restart when not actually needed, there's a fix with host libssl on newer distributions breaking some titles, a crash when purchasing in-game items in Big Picture and so on. It's really damn good to see much more attention to the little issues being done in the Steam client lately, credit where it's due Valve have been putting in a lot more effort lately and it's showing. There's plenty more tweaks like the usual updates to Steam Input now supporting the HORI Battle Pad, HORI Wireless Switch Pad, PDP Wired Fight Pad Pro and the PDP Faceoff Wired Pro Controller. Full update notes here. Unlike Epic store - this is what I like to see - Valve adding value to their Steam platform for consumer benefit. Yes works well, it would still be nice to have a option to choose to install a Native linux game vs its windows proton counterpart. TheRiddick Yes works well, it would still be nice to have a option to choose to install a Native linux game vs its windows proton counterpart. True, but for now you can just force Steam Play in it before downloading. Neat, I've been using a workaround to accomplish basically the same thing, it's good to see it properly implemented. I don't know what I'm doing wrong, but haven't had any success running any external games on steam. Usually when I add an executable it doesn't fill in the location points correctly. But even after editing the launch options I still haven't had any success.. Unless I'm just unlucky with the games I've tried. Maybe I will try another. On a positive note, I found that somebody has gone to the effort of integrating gallium-nine into a proton build, which works very nicely on Alan Wake and Borderlands (the two games I've tested so far). I don't understand how you can install a GOG Windows game through Steam. In the screenshot in the article, the game is already installed, and you create a shortcut to run it through Steam. That's OK. 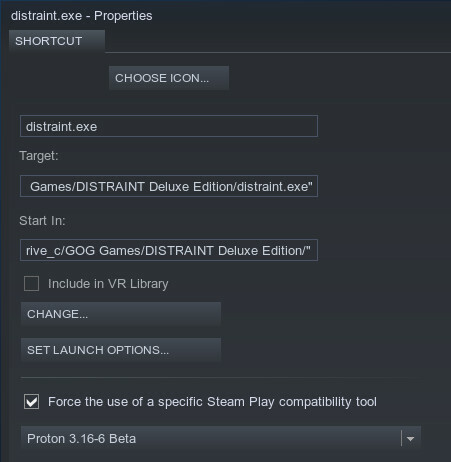 But how do you install it, from a GOG installer, using Proton? lejimster I don't know what I'm doing wrong, but haven't had any success running any external games on steam. Usually when I add an executable it doesn't fill in the location points correctly. But even after editing the launch options I still haven't had any success. I had a hard time with it too, the paths I picked from the options didn't seem to get added properly and I had to mess around a bit. For the only game I use this way I ended up having to insert wine commands instead of just file paths, so maybe you need to do the same? The second parameter in particular doesn't make any sense whatsoever to me, but it works.